You can download the report in its entirety or by section. If you are not a member then you can Purchase Publication. You will need to register for a free Non-Member account in order to complete your purchase. The ever increasing flow of studies on health & wellbeing has made filtering and processing the information challenging for the property industry. Consensus on approach is proving difficult as the sector is faced with competing frameworks for assessment, a raft of new processes, uncertainty around the strength and relevance of the evidence base and concerns around cost. Through its study, the BCO has taken a unique approach by creating a strategic ‘Roadmap’ to health & wellbeing based on 55 outcomes, identified through collaboration with leading health & wellbeing experts. The aim has been to help the industry to understand what matters, why it matters and when it matters and who is best placed to lead across the broad range of health & wellbeing issues irrespective of certification pressures. Working with leading medical and academic experts the project has reviewed the existing evidence base of leading sustainability and health & wellbeing standards. The result is an outcome-focused framework against which these standards have been mapped. 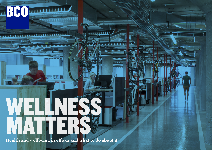 By doing so the study provides a concise point of reference for clients and their advisors as well as design and construction teams and sets out the best practice guidance for implementing and achieving health & wellbeing across the office life cycle.